Parcel volume grew from 44 billion parcels in 2014 to 65 billion in 2016, and the increase in growth shows no sign of slowing down, continuing to rise at a rate of 17-28% each year between 2017 and 2021, a report from technology provider Pitney Bowes said. For the second edition of its annual Parcel Shipping Index, the company measured parcel volume and spend for business-to-business, business-to-consumer, consumer-to-business and consumer consigned shipments with weight up to 31.5kg, across 13 major markets including Australia, Brazil, Canada, China, France, Germany, India, Italy, Japan, Norway, Sweden, the UK and the USA. In China, a new addition to this year’s Index and by far the largest market examined, parcel volume expanded by 52% in one year, increasing from 21 billion parcels in 2015 to 31 billion in 2016. But even excluding China’s prolific volumes, the Index forecasts a strong and accelerating pace of growth in parcels throughout the world. The U.S. (13 billion) and Japan (9 billion) were also among the largest markets by parcel volume. In terms of investment, the U.S. ranked highest, spending US$96bn on parcel shipments, followed by China at US$60bn and Japan at US$22bn. 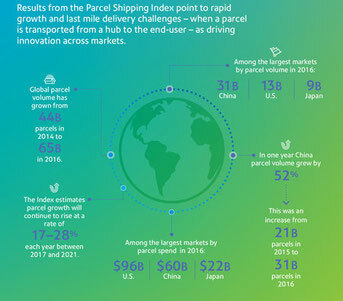 Results from the Parcel Shipping Index point to rapid growth and last-mile delivery challenges as driving innovation across markets. New trends and emerging technologies, such as parcel lockers, crowd-shipping, on-demand delivery services, evening and weekend delivery and drones, are impacting the customer shipping experience by shortening delivery times, lowering delivery costs and adding flexibility.